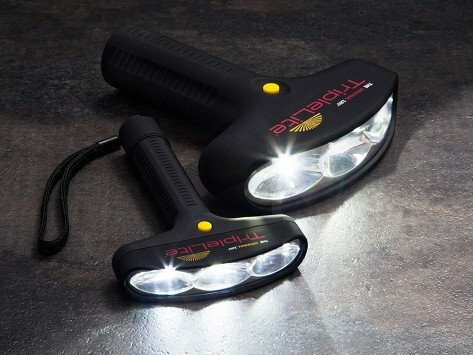 Lighten things up with a wide beam flashlight that illuminates your natural field of vision. A curved design and three ultra-bright LED bulbs create a 180 degree arc of light, providing improved visibility in all directions—not just straight ahead. Dimensions: Mini: 6" x 4" x 5"; Original: 7" x 5.8" x 1.6"
Weight: Mini: 0.25 lb. ; Original: 0.33 lb. This light gives off lots of light. It is very lightweight also. I bought four of these lights for Christmas presents this past Christmas. My husband, sons ad son-in-law absolutely loved them! I wanted oneed one more after Christmas and had to wait for the reorder to arrive. Great! My husband loves flashlights and this was a hit. I love that it helps me see my path, where I'm going and what is around. 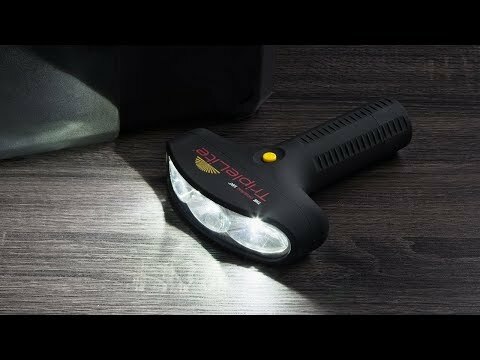 The idea to create a wide beam flashlight was born when Ron Pritchett had a near-miss spill on the basement stairs. He was doing that back and forth motion with his flashlight to sweep light across the entire area in front him, and it caused him to miss a step and nearly fall. He invented TripleLite to illuminate a 180 degree arc, which matches your field of vision. The curved design gives you major visibility, thanks to three carefully-arranged, ultra-bright LED bulbs. His smart, simple upgrade really was a bright idea.